This Holiday season is a bit hectic - buying presents from everyone you often cannot make it to the store and have to order it all online. Deliveries from all sorts of places arrive on the same day, and that’s usually not a problem. Not in this case, though, where both a FedEx and a UPS package arrived with a couple of hours of difference, and the person who had to get them isn’t at home. First, a FedEx package, which turned out to be an iPad, is delivered. The gadget is a gift for the homeowner’s daughter. All is good and well until a second package arrives, this time delivered by a UPS guy. 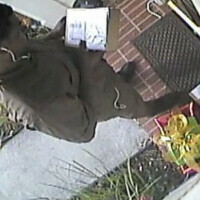 All looks normal - he rings the bell, no one answers so he drops in his package and walks away. But it’s not all that simple. Luckily, a turned on security camera records everything, including the shadowy return of the UPS guy who then just steals the iPad that was delivered by FedEx and walks away with it under his clipboard. Hopefully, his heart warms and he brings it back, but for the time being it is one less gift for a kid. Yup. his action probably just costed him his job. Probably? This has to be the easiest bust ever...plus he'll have a felony on his record! What a gift to himself! Him losing his job is now the least of his problems, very stupid. I know the iPad is a steal but this is wrong. LOL. probably the mini-Ipad. You must be rich because $329 is not a steal. Maybe FedEx should use this for a commercial against UPS... "Oooops, who do you trust". Company should keep a strict rule not to open packages meant for someone else! And what was the guy thinking??? I think thats extremely obvious and it's probably a felony. Some people have no respect towards other people, some people's actions still amaze me! He looked at it before he put it under his tablet thing. Clearly it was Fedex. In California, anything over a value of $400 is a felony. So, this guy could be screwed depending where he lives. Considering that if he's caught stealing something that costs ¢40 he'll most likely be fired, he's screwed no matter where he lives. Actually, that section of the Penal Code just got updated. 487PC Grand Theft is now $950.00. You just hate to see this, you have xmas gifts on the way for your love ones and this animal takes the package for himself. I have no remorse for a person like this, not only should he lose his job, a jail sentence, and emotional damages lawsuit should be paid to the family. So sad, first it was people following around the UPS guys and swiping the packages after they leave...now its the UPS guys stealing the packages!!! Oh the irony...and he had such a cush job! Maybe he didn't steal it. Just hold on to it when owner comes home. That's horrible but no surprise to me. I have had horrible experience with UPS. 2 years ago, my sister(who is in the AirForce) purchased and shipped a $1,200 Watch for my father and an award plaque for my mom, since she was stationed upstate California for Xmas and when the UPS guy dropped it off the box was damaged and opened. It was covered by their insurance. Someone stole it, we notified UPS that our package was stolen. They couldnt find out who stole it, and we didnt get any compensation for the lost watch. Along with last year I ordered simple phone, tablet and macbook cases about 5 ($70 total) through ebay and the shipper went through UPS. so again in December I only received 2 cases which I notified the seller they were not responsible. I contacted UPS and they said sorry there is nothing we can do. I was seriously shocked but isnt there a like a huge liability for a company who loses customers packages and should be compensated. It was delivered to the wrong address, simple as that! Lucky the second guy figured it out in time! That's why expensive or valuable items over $50 in value shouldn't be left at a residence unattended. It could've easily been a random neighbor that thought this package was a steal as well. But what an idiot. Scumbags everywhere. Such a great world we live in lol. If the driver is in any type of union, he is not going to lose his job. All he has to do is claim he was stressed out, at most he will get a smack on the wrist. The way you all are describing the guy, makes it sound like he killed all the kids in Connecticut. guess wat....the guys black!!!!!!!! JK guys im not racist, im a minority myself.